This article is about the album. For the song, see Age Ain't Nothing but a Number (song). Age Ain't Nothing but a Number is the debut studio album by American R&B recording artist Aaliyah, released under Jive and Blackground Records on May 24, 1994, in the United States. After being signed by her uncle Barry Hankerson, Aaliyah was introduced to recording artist and producer R. Kelly. He became her mentor, as well as the lead songwriter and producer of the album. The duo recorded the album at the Chicago Recording Company in Chicago, Illinois. The album featured two hit singles, including the top ten-charting "Back & Forth" and "At Your Best (You Are Love)"; both singles were certified Gold by the Recording Industry Association of America (RIAA). One additional single followed in the U.S.: "Age Ain't Nothing but a Number". Two more singles were released internationally after "Age Ain't Nothing But a Number": "Down with the Clique" and "The Thing I Like". Age Ain't Nothing But a Number received generally favorable reviews from critics. Many noted Aaliyah's vocal ability and praised the lyrical content. Aaliyah was credited for redefining R&B by blending her voice with Kelly's new jack swing. The album peaked at number 18 on the Billboard 200 and sold over three million copies in the United States. The album was certified Gold in Canada by the Canadian Recording Industry Association (CRIA) and Gold in the United Kingdom by the British Phonographic Industry (BPI) to date. The album has sold over six million copies worldwide. After Barry Hankerson, Aaliyah's uncle, signed a distribution deal with Jive Records, he signed her to his Blackground Records label at the age of 12. Hankerson then introduced her to recording artist and producer R. Kelly. He became Aaliyah's mentor, as well as lead songwriter and producer of the album. Aaliyah and Kelly began recording the album in 1993 when she was 14. The duo recorded the first song, "Old School", at the Chicago Recording Company in Chicago, Illinois. While recording the album, Kelly coached her as they worked several hours in the studio. She often sang the songs multiple times in order to achieve "excellence". He claimed that Aaliyah was "one of the best young artists" he had worked with. Aaliyah sang her songs in a falsetto. She felt that the songs "came at you kind of tough, a bit edgy, hip-hop, but the vocals can be very soothing". She went on to say, "lyrically I want things to be different." Age Ain't Nothing But a Number received generally favorable reviews from music critics. Some writers noted that Aaliyah's "silky vocals" and "sultry voice" blended with Kelly's new jack swing helped define R&B in the 1990s. Her sound was also compared to that of female quartet En Vogue. Christopher John Farley of Time magazine described the album as a "beautifully restrained work", noting that Aaliyah's "girlish, breathy vocals rode calmly on R.Kelly's rough beats". Stephen Thomas Erlewine of Allmusic felt that the album had its "share of filler", but described the singles as "slyly seductive". He also claimed that the songs on the album were "frequently better" than that of Kelly's first studio album, 12 Play. The album debuted at number 24 on the Billboard 200 chart, selling 74,000 copies in its first week. The album ultimately peaked at number 18 on the chart. It sold three million copies in the United States and 6 million copies worldwide. In Canada, the album sold over 50,000 copies and was certified gold by the CRIA. It also peaked at number 44 on the Dutch Albums Chart; it peaked at number 23 on the UK Albums Chart, where it was certified Gold by the BPI. All songs were written and produced by R. Kelly, except for "At Your Best (You Are Love)", written by Ernie Isley, Marvin Isley, O'Kelly Isley, Jr., Ronald Isley and Chris Jasper. ↑ "Aaliyah Age Ain't Nothing But A Number - Album Review - Slant Magazine". 1 2 "Aaliyah". The Daily Telegraph. London: Telegraph Media Group. November 22, 2001. Retrieved May 17, 2009. ↑ Perrone, Pierre (August 27, 2001). "Aaliyah - Obituaries, News". The Independent. London: Independent News & Media. Retrieved May 17, 2009. ↑ "Aaliyah: Latest Victim of Crashes That Cut Short Fame - Obituary". Ebony. FindArticles. November 2001. Retrieved May 17, 2009. ↑ Dansby, Andrew (August 27, 2001). "Aaliyah Dies in Plane Crash". Rolling Stone. Wenner Media. Archived from the original on 23 June 2009. Retrieved May 17, 2009. ↑ "Music: Age Ain't Nothing But A Number (CD) by Aaliyah (Artist)". Tower Records. Retrieved May 18, 2009. 1 2 "Chart Beat Bonus". Billboard. Nielsen Business Media. August 31, 2001. Archived from the original on 26 August 2009. Retrieved August 26, 2009. 1 2 3 4 "RIAA - Gold & Platinum". Recording Industry Association of America. Archived from the original on July 13, 2015. Retrieved April 14, 2009. ↑ "Aaliyah". 30 June 2000. ↑ "Hundreds Say Good-Bye To Aaliyah". ↑ Pareles, Jon (August 27, 2001). "Aaliyah, 22, Singer Who First Hit the Charts at 14". The New York Times. The New York Times Company. Retrieved September 14, 2009. 1 2 3 Erlewine, Stephen Thomas. "Age Ain't Nothing But a Number - Review". Allmusic. Retrieved May 17, 2009. ↑ Larkin, Colin (2011). Encyclopedia of Popular Music. Omnibus Press. p. 1914. ISBN 0857125958. 1 2 3 Ehrlich, Dimitri (June 17, 1994). "Age Ain't Nothing But a Number - Music Review". Entertainment Weekly. Time. Archived from the original on 21 April 2009. Retrieved May 17, 2009. ↑ Harris, Keith (2004). "Aaliyah". In Brackett, Nathan; Hoard, Christian. The New Rolling Stone Album Guide. Simon & Schuster. p. 1. ISBN 0743201698. Retrieved September 24, 2015. 1 2 Cinquemani, Sal (2001). 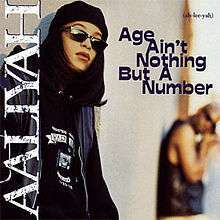 "Aaliyah: Age Ain't Nothing But a Number". Slant Magazine. Archived from the original on 9 May 2009. Retrieved May 17, 2009. ↑ Rolling Stone Album Guide. Books.google.com. Retrieved 2011-11-15. ↑ Farley, Christopher John (August 26, 2001). "Siren of Subtlety". Time. Time. Retrieved September 14, 2009. ↑ "Billboard 200 - Week of June 11, 1994". Billboard. Nielsen Business Media. Archived from the original on 1 May 2010. Retrieved May 1, 2010. ↑ "Aaliyah's Profile". SS Music. Archived from the original on 9 April 2010. Retrieved May 1, 2010. 1 2 3 "Age Ain't Nothing But a Number - Aaliyah". Billboard. Nielsen Business Media. Archived from the original on 26 August 2009. Retrieved August 26, 2009. ↑ Pesselnick, Jill (November 17, 2001). "Madonna Earns Another RIAA Diamond". 113 (46). Nielsen Business Media: 69. ISSN 0006-2510. Retrieved May 17, 2009. ↑ Archived April 9, 2010, at the Wayback Machine. 1 2 3 "Canadian Recording Industry Association (CRIA): Certification Results". Canadian Recording Industry Association. Archived from the original on 1 June 2009. Retrieved May 17, 2009. 1 2 3 4 5 "Aaliyah - Age Ain't Nothing But a Number (Album)". Ultratop. Archived from the original on October 8, 2012. Retrieved May 17, 2009. ↑ "Aaliyah - Age Ain't Nothing But a Number". Chart Stats. Retrieved May 17, 2009. 1 2 "Certified Awards Search". British Phonographic Industry. Archived from the original on March 5, 2011. Retrieved August 26, 2009. ↑ "Age Ain't Nothing But a Number: Aaliyah". Amazon.com. Retrieved May 18, 2009. ↑ "AALIYAH - full Official Chart History - Official Charts Company". ↑ "Aaliyah Album & Song Chart History". Billboard. Retrieved September 28, 2010. Brackett, Nathan; Hoard, Christian David (2004). The New Rolling Stone Album Guide: Completely Revised and Updated 4th Edition. Simon & Schuster. ISBN 0-7432-0169-8. Farley, John (2002). Aaliyah: More Than a Woman. Simon & Schuster. ISBN 0-7434-5566-5. Kenyatta, Kelly (2002). An R&B Princess in Words and Pictures. Amber Books Publishing. ISBN 0-9702224-3-2. Sutherland, William (2005). Aaliyah Remembered. Trafford Publishing. ISBN 1-4120-5062-6.